As you may know, I love to cook. Here is a simple brunch recipe I found on line from Martha Stewart. 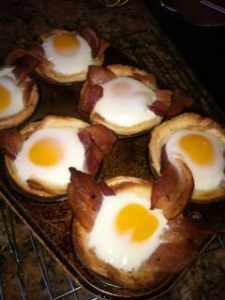 Egg, Bacon & Toast Cups. Simple and elegant. Here’s the link. If you want to share recipes, drop me a line. With summer here now, I can grill more delicious meals. And our garden is looking good; corn, squash, cucumber, lettuce and tomatoes.